Making the most of circumstance on the Juniata River Sojourn. Every year, during the second weekend in June, a group of about 50 canoes and kayaks filled with enthusiastic paddlers make their way downstream, enjoying the river, camping, socializing, and participating in an event that has become a fixture in the area. 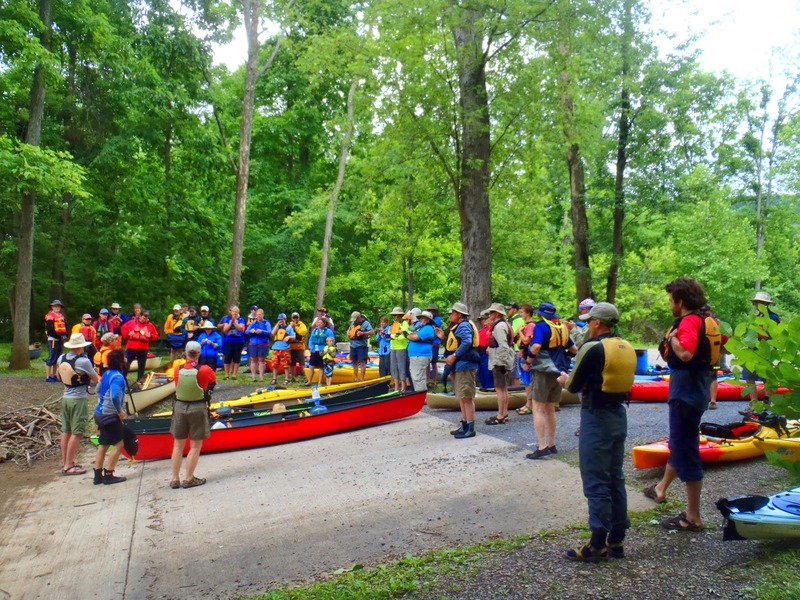 This is the Juniata River Sojourn, one of many River Sojourns throughout PA that promote watershed conservation and stewardship while providing a fun and inspiring experience. The first Juniata River Sojourn took place in 2001, and until this year, has been organized by the Juniata Clean Water Partnership. Unfortunately, funding cuts left the non-profit organization unable to take on the financial responsibility and time of organizing the Sojourn this year, but Rothrock Outfitters of Huntingdon stepped in to take over organizational responsibility in addition to their usual guide services they’ve been providing for the event for years. The annual Sojourn rotates between three different sections of the watershed—the Little Juniata and Frankstown Branch, the Mainstem, and the Raystown Branch, this year’s locale. The plan was to paddle from Everett to Heritage Cove Resort over the course of three days, stopping to camp at specified locations along the way. However, Mother Nature had other plans, as inches of rain dumped on Central Pennsylvania in the days preceding the scheduled event, rendering the Raystown Branch of the Juniata at a level too high to safely lead a group of paddlers of varying experience. 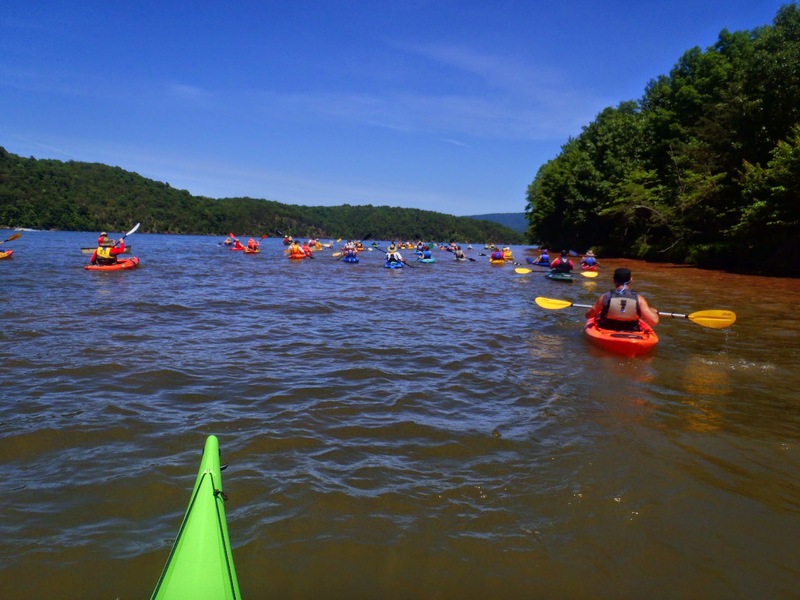 But rather than cancel the event that is important to so many, a new plan was made—paddle the length of Raystown Lake instead, beginning at Heritage Cove and ending up at Snyders Run. The clouds and rain cleared just in time for the multi-colored flotilla of canoes and kayaks to launch on Saturday morning, and paddlers of all ages, from 7 to 70, began to make their way down the lake, keeping a steady but casual pace while enjoying the scenery, beautiful weather, and the occasional great-blue heron flying by. Farther down the lake, as the channel widened, the great-blues disappeared but we did have an eagle sighting. The three-day event ended in the early afternoon on Monday after a short and much-quieter paddle from Susquehannock Campground to Snyders Run, where goodbyes and til-next-years were exchanged.